Description: Scrambling perennial, glabrous, stems slender, to 2 m long. 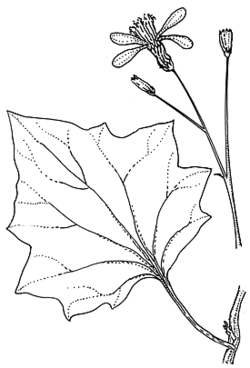 Leaves with lamina ± broad-ovate, 4–7 cm long and wide, margins ± palmately lobed or coarsely toothed, lamina glabrous, ± fleshy, venation palmate; petiole 20–50 mm long. Inflorescence corymbose, many-headed; heads cylindrical, c. 3 mm diam. ; involucral bracts 5–7, 6–7 mm long; bracteoles 2–4. Ray florets 3–6; ligules c. 10 mm long; disc florets 10–12, 12–15 mm long. Achenes c. 2 mm long, glabrous; pappus 6–7 mm long. Distribution and occurrence: Naturalized in moist gullies in Sydney district, North Coast and South Coast. Native of S Afr.